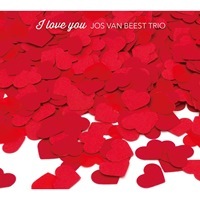 Description: Dutch pianist extraordinaire Jos van Beest returns to Atelier Sawano with his sixth trio album, although, to be precise, the trio is augmented by guitarist Joost Zoeteman on four tunes. The program, consisting of well-known standards and a couple of van Beest's originals, begins with "Hello Dolly" with a surprising bossa nova arrangement. I don't think I've heard it with a flowing, medium tempo bossa nova rhythm, and it works brilliantly! It is followed by the pianist's original "Tokyo City Lights" in which he manages to use just a small number of oriental scales to suggest the Asian feel. van Beest uses notes as his paint and the keys as his brushes and paints the landscape of his heart. It is always full of emotion and colored with poetic beauty. Another important point is that he always swings. As the title suggests, the music is full of love and tenderness. The sound quality is exceptional, even by the high standards of Atelier Sawano. A wonderful, lovely and melodious piano trio album! Recommended!